I have been requested to readdress the complaint that many people feel stuck in the upper right quadrant. There is no way to be "stuck" in this phase. 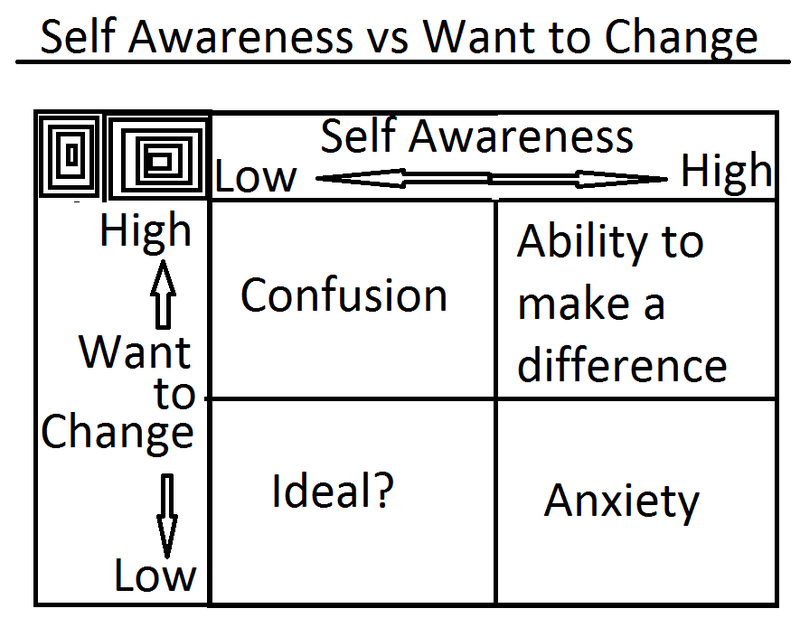 If you feel both highly aware of yourself and your environment, and also have a high will to change this situation resolves itself and you return to the lower left quadrant. Those that feel stuck here have their head in the clouds. You are much more likely to be in the top left or lower right sections. You either consider yourself more self aware than you are in reality or you do not actually want to change. There are three scenarios that then play out going forward. 1. You need to re-evaluate your life choices, environment, and what makes you, you. Any change in this attitude will affect your whole equilibrium and your position on my crudely drawn map. If you are sure of your understanding of yourself, continue. 2. You don't have as much want to change as you thought, so your choices and lifestyle continue drifting. Being aware of the changes you want to make doesn't mean you have the willpower to act on your new realizations (and that's okay). You can realize your flaws but still be unable to overcome them, or overcome them soon. Here you may need to plan time to change. If you find you can't put enough time towards change, are you sure you want it at all? Not wanting it enough will leave you here, with anxiety. I advise finding your breakthrough moment to change, or accepting that now is not the right time and changing your mindset back down to the lower left section. This will reduce your anxiety as you move your misguided self awareness to the back of your mind, where you can return to it later. 3. You realize what you have is actually what you want so return to the resting position in the lower lefthand section. Calmly considering all of these scenarios, you may even find the right course of action is to change your mindset entirely. This is actually a desired resting state between moments of breakthrough change.